The 2009 spring turkey hunting season continues through May 24, with some variable dates in specific hunting units. Over-the-counter licenses are available throughout Colorado. It's time for hunters to talk turkey. Colorado's spring turkey hunting season opens April 11, offering hunters one of the state's most unique field experiences. According to information from the Colorado Division of Wildlife, wild turkeys put on quite a show from late April through mid-May, when turkeys are at the height of their mating season. The hens are calling for the toms, and the toms are on the move looking for mates and putting on their displays of wild machismo. "There is nothing else like hunting turkeys," said Tom Spezze, southwest regional manager for the Colorado Division of Wildlife. "You call them in, the toms are making all kinds of noises spitting and drumming, and they'll get right next to you. It's incredibly exhilarating." The 2009 spring turkey season continues through May 24, although dates vary in some specific hunting units. Over-the-counter licenses can be purchased for most units in the state. Some areas are limited. Complete information in licensing is available in the 2009 turkey hunting brochure from the DOW. Turkey hunters can use shotguns and bows during the spring hunt. Shots are usually made within 30 yards of a bird. Only toms cam be hunted during the spring. Because turkeys are wary and spook easily, hunters are allowed to dress in full camouflage. DOW officials issued a note of caution: Because hunters wear camouflage, turkey hunting can be dangerous in popular areas. Hunters are urged to exercise extreme caution. Hunters in the field often signal each other by whistling. Turkeys roost in trees at night, so the hunter's first task is to locate the resting spot. Spezze recommends that hunters arrive near the roost just before dawn and find a place to set up without spooking the birds. Hens welcome the day with a very sleepy "tree call." The toms will gobble in response to nearly every hen call made in the roost. After adequately announcing the day, the birds will fly down from the roost once light is full. Then they'll begin calling to gather the flock for the day. 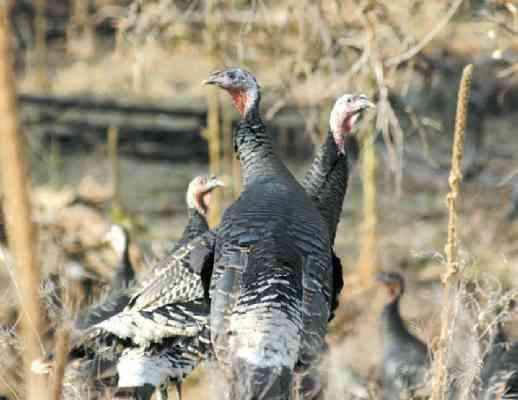 Seasoned spring turkey hunters usually begin calling to the toms before any of the birds fly down in an effort to direct them away from the roosted hens. A common mistake turkey hunters make is "over-calling," Spezze said. Hunters should only imitate the various calls the turkeys are making at that moment. "Nothing scares off an already wary tom more than calls that are too loud or too frequent," he said. As toms approach, the hunter must sit absolutely still. Any shot must be executed very quickly. Shotgun pellets won't penetrate a turkey's plumage, so the aim must be at the head and neck. Two types of turkeys live in Colorado. The Merriam's turkey lives primarily in the mountains, while the Rio Grande turkey lives on the flat lands east of Interstate 25. Populations of both types of turkey are healthy and have been growing the last few years, according to the DOW. The Merriam's turkey is partial to open meadows and usually roosts in ponderosa pine trees. They can also be found in oak brush and pinon-juniper stands. Hunters should find areas where turkeys have cover, forage and nesting habitat. Hunters should look for meadows in narrow valleys where there are grassy areas, aspen groves and ponderosa pines. The Merriam's turkeys, however, are wanderers and will roam over large areas. The Rio Grande is the larger of the two birds and can usually be found in cottonwood trees and along riparian areas. The birds are creatures of habit, often roosting in the same tree and feeding in the same fields every day. Rio Grande turkeys are easier to locate than Merriam's and hunting them is generally not as difficult, according to the DOW. Hunters should scout areas looking for signs - tracks, feathers, droppings, scratching and dusting areas. Turkey calls also are essential, including box calls, slates and mechanical-plunger calls. Hunters should not try to stalk turkeys in the spring because chances of success are slim, the DOW said. Hunters are encouraged to set up in a somewhat concealed location and wait for the birds to come to the spot. Hunting in the morning is typical, but toms also can be called in late in the afternoon. The long season also works to the hunters' advantage, according to the DOW. Some of the best hunting occurs late in the season when hens are on the nest. Successful hunters are rewarded with fine, lean meat, according to the DOW. With careful cooking, wild turkey can make an excellent and highly nutritious meal.